Backyard Beekeeping for the Absolute Beginner - What the true beginner beekeeper needs to know to get started! Focus on urban, backyard beekeeping. Are you thinking about starting a backyard hive, curious about what’s involved with beekeeping or just want to learn more about bees? 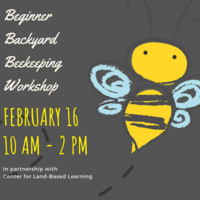 Beginner Urban Backyard Beekeeping is a great introductory class for you. The class is designed for absolute beginners so no prerequisite knowledge is required. You can walk in knowing absolutely nothing about bees and walk out with practical knowledge ready to get started with your own backyard beehive. Location: The Ranch House at The Cannery in Davis.